Support maintenance engineers fighting for a UNION! Engineers at Douglas Emmett properties in Los Angeles make the city work. They voted to stand together in a union so they’d have a voice. A voice for better pay. A voice for safety on the job. A seat at the table when the company makes decisions that affect workers and their families. But Douglas Emmett is defying these workers’ federal right to join a union and bargain collectively. The company is engaging in union-busting, plain and simple. Show your support for Douglas Emmett workers by signing the petition today to tell company management to respect their right to stand together in a union! 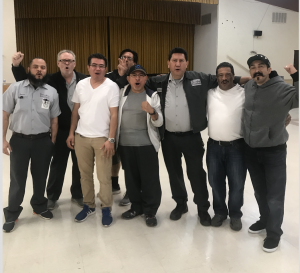 Douglas Emmett management has been threatening, harassing and retaliating against workers who are lawfully standing together to exercise their right to join a union. When companies engage in these unlawful tactics, it hurts workers, their families and our entire community. Enough is enough. It’s time for Douglas Emmett management to stop the harassment and work with their employees collaboratively. Please sign the petition calling on Douglas Emmett CEO Jordan Kaplan to immediately disavow the threats and retaliation against workers and negotiate in good faith on a fair contract!